When Dr. Paul A. Offit published “Autism’s False Prophets” in 2008, he elected to skip the usual round of book signings. His defense of childhood vaccinations so enraged some people who consider them a cause of autism that he was getting credible death threats. Others might have chosen to flee the public arena after that, but not Dr. Offit, the chief of infectious diseases at Children’s Hospital of Philadelphia, whose appetite for the good fight seems only to have grown. Over the last decade he has become a leading debunker of mass misconceptions surrounding infections and vaccines, and now he is taking on the entire field of alternative medicine, from acupuncture to vitamins. This territory is not all that far from his usual stomping grounds; some of vaccination’s rabid opponents are enthusiastic supporters of unconventional medical interventions. Nor has Dr. Offit’s own stance changed: He speaks for rational, scientific medicine (and medicines) whose efficacy has been confirmed in impartial, reproducible clinical trials. Everything else, no matter how venerable, highly recommended or self-evidently 100 percent terrific, he places on the spectrum between unproved and dangerous….. Yet studies have shown that not only do vitamin supplements fail to lower cancer risk, but they can actually cause cancer – most notably the 1994 Finnish study that found smokers who took beta carotene – which the body converts to vitamin A – actually had a higher risk of lung cancer than men who didn’t take the supplements. Alternative therapies of all kinds are often not only of no benefit whatsoever — they can be harmful, he notes…. Editor’s note: Dr. Paul Offit is chief of the division of infectious diseases at the Children’s Hospital of Philadelphia and author of the book “Do You Believe in Magic? The Sense and Nonsense of Alternative Medicine.” He previously has taken on the anti-vaccine movement. And it has moved into the mainstream. Hospitals now have dietary supplements on their formularies (list of stocked medications); offer reiki masters to cancer patients; or teach medical students how to manipulate healing energies. “I try at home to make everything gluten-free for him because the difference in his comfort is unbelievable when he’s sticking to what he’s meant to be eating,” she told the doctor host. 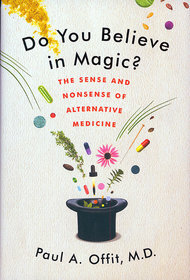 “[Paltrow] is saying natural is ‘all good.’ But that’s not true,” explains Dr. Paul A. Offit, author of the book “Do You Believe in Magic?” (Harper), a damning takedown of the alternative-medicine industry. “This is largely unregulated industry, and we aren’t told about many of the negative effects. We wade in without a lot of knowledge.”….